With all of the changes in the commercial lending industry, including institution acquisitions, bank recapitalizations, loan portfolio sales, and on-going regulatory loan review requirements, there is plenty of demand for experienced loan review consultants that can provide detailed feedback on the quality and performance of a loan portfolio. There are numerous companies that provide loan review services, but many of them are accounting firms that primarily use entry-level accountants as auditors, who have no real street experience in commercial lending. 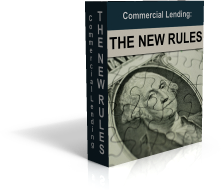 What sets Commercial Lending X (“CLX”) apart is our staff made up of experienced commercial lenders, credit analysts and credit managers, all of which have real world lending experience and have experienced the ups and downs of the lending market. Our staff understands what both a good and a bad loan and portfolio looks like, and fully understand what the regulators expect to see as we have extensive experience in working with regulators. When CLX conducts a loan review, the work goes above and beyond providing just general analysis and comments on several loans or more broadly on the loan portfolio, but also provides detailed insight into all aspects of loan underwriting, credit management, the approval process, and makes recommendations for on-going best practices to help maintain a healthy loan portfolio. Bank Acquisition Analysis – If an investor or institution is looking to acquire an existing Bank, CLX can come in and complete a detailed analysis of the existing loan portfolio. This analysis will not only include a loss risk analysis on a large percentage of the portfolio, but will also include a loss extrapolation for the entire loan portfolio as well as detailed comments about the existing credit culture, credit quality, underwriting process, regulatory risks, non-performing and OREO loan analysis, along with other information. This analysis will provide the investor with detailed insight into the credit quality and risk associated with acquiring that institution. Recapitalization Analysis – If an investor is looking to invest in and recapitalize an existing institution, either the investor or institution will typically hire us to perform a similar detailed review as we complete for Bank Acquisitions. However, this review will focus on providing guidance and best practices for the institution that ordered the review so it not only benefits the investor, but also provides guidance and recommendations to help benefit the institution as well. Loan Portfolio Sale Analysis – Whether an investor is considering purchasing part of a Bank’s existing loan portfolio, or an institution is considering selling part of their loan portfolio and wants to know how the market will value it, CLX can provide a detailed analysis on the portfolio to be sold or acquired. This analysis includes a full underwriting including detailed collateral review and comparable value assessment for each loan in the portfolio to be sold, a detailed loss analysis, a detailed risk analysis, and an anticipated market valuation for each loan to be sold. On-Going Loan Review – New regulatory requirements mandate many institutions to have outside consultants complete external loan reviews. CLX can come in bi-annually, annually, semi-annually, or as required by the institution to complete a detailed loan review on a percentage of the loan portfolio. Typically CLX looks at between 15% to 30% depending on the institution’s requirements with each review. The review can focus on underwriting, portfolio performance, documentation, approval and policy compliance, on-going review and monitoring, or any combination of these areas. CLX’s report not only provides a detailed analysis on each individual loan reviewed, but also provides a detailed report with analysis, trends, insight into future portfolio performance, analysis against previous reports, and recommendations for improving the portfolio. Loan Loss / OREO Review – From time to time institutions want to get a better handle on their existing non-performing and OREO loans to better assess potential future losses. CLX can review these portfolios providing a detailed analysis on each loan including potential loss rates based on risk, a detailed collateral review with comparable market data used to determine the potential exposure, and a report with recommendations for the best means to manage the problem loans. Custom Loan Review – CLX has the ability to cater solutions to just about any need as it relates to commercial loan portfolio review and management. CLX has been active in loan review and management since our inception in 2009 and has worked assignments throughout the Country for institutions ranging in size from $100 million to $5 billion. We certainly have the expertise, staff, and knowledge to assist you with your next loan review. CLX’s cost is very competitive with that of our peers, yet the quality, expertise, and detail of our reports goes beyond most of our peers, and provides our clients, their management and their Board of Directors with much more detail then the reports of our competitors. Initial Meeting with Bank Management – CLX meets with Bank management and determines their needs and requirements for a loan review. CLX then puts together a detailed proposal verifying those needs, detailing the data that will be provided, and outlining the cost. If the proposal is accepted, CLX can typically start work within as little as two weeks for assignments that need to be completed quickly. Assignment Preparation – CLX works with the institution to determine the loan sample and to set-up file access, space and technology needs (which varies depending on the assignment but CLX staff utilizes their own computers), and to cover any other details necessary for the assignment to go smoothly. Loan Review / Time Involvement – Depending on the size and detail of the assignment, CLX will typically spend several days to up to two weeks onsite to complete the data collection portion of the assignment. Our focus while onsite is data collection and looking for trends within the portfolio. Our goal is to minimize our time onsite with our clients and hence minimize the impact we have on their on-going operations and staff. We typically complete final review of each file and recommendations offsite. Loan Review / Interviews & Progress Meetings – While onsite we will conduct several interviews with key staff members, review Bank policies (depending on the type of assignment), have several progress meetings with Bank management, and have an exit interview with Bank management before we leave covering all initial findings and concerns. Loan Review Report – Once offsite it typically takes between one to three weeks depending on the size and detail of the assignment to complete the underwriting and provide an initial draft of the report. Report Review with Bank Management – CLX immediately follow-ups providing a draft of the report with a conference call or meeting with Bank management (depending on what works out most convenient and is necessary) to review the report. CLX will typically take into consideration comments, recommendations, and any additional information provided by Bank management at that time, and will then review and revise the report, with a final copy of the report typically provided within no more than a weeks time from the review meeting. Follow-Up Availability – CLX staff will be available for conference calls with potential investors, management, or Boards to further discuss the report and answer any questions or concerns that report may create. Final Report / What Is Included – All reports provided by CLX are very detailed and provide clear insight to Bank Management on the on-going performance, underwriting, and management of their loan portfolios. The report will include a written report with recommendations, typically a supplementary report with comments on specific loans where there were issues or concerns, a roll up providing detailed analytical information on the portfolio reviewed including a summary of the findings, and a very detailed loan review report for each loan reviewed including a risk, collateral, and loss analysis detailed for each loan.